I flew down to Memphis, Tennessee on Thursday to attend the 21st annual Memphis Italian Festival in Marquette Park, which benefits the Holy Rosary Parish School. The festival offers a number of family friendly activities including contests, musical performances, grape stomping and of course endless concessions cooking up Italian American food favorites from sausage and pepper sandwiches to zeppoli. 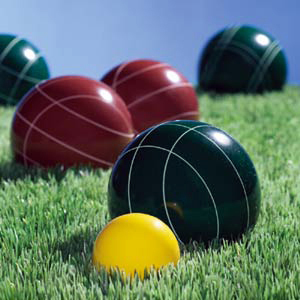 For me the highlight of the three-day celebration is the Galtelli Cup Bocce Tournament that kicks off the fair. Each year 32 teams compete on six courts in this single elimination tourney. My team Bella Sera (representing Delta Wholesale) was comprised of me and a few friends I became close with back when I coached the Memphis Grizzlies: David Hudman, Bill Lucchesi and Jim Lucchesi. Our team took the title in 2005, ‘07 and ‘08, but we had to sit last year out due to a scheduling conflict so I was concerned we might be a little rusty. The tournament is always competitive, however this year we were met with an unexpected obstacle. After the first round on opening night the sky opened up and heavy rains poured down hard and long, effectively shutting down the tournament and leaving the bocce courts completely submerged under water. This forced all of the contestants to return on Friday to complete the competition. We were doubtful that the flooded courts would even be playable, but the festival volunteers did an incredible job restoring the courts. They got there early the next morning, panned water, raked, added dirt on top and managed to get 5 of 6 courts back in working order. Despite the disruption our team maintained its focus and returned to the competition in top form. It’s unusual for all four guys to give consistently good performances, but we all played well and contributed. After a fun yet demanding day on the courts, team Bella Sera came away with its fourth Ralph Galtelli Cup. Afterwards we celebrated our victory at the Rum Boogie Café located in the heart of downtown Memphis on the corner of Beale Street. Rum Boogie happened to be celebrating its 25th anniversary so they featured different live blues bands every couple hours and the place was hopping. We capped off a great weekend with a great night on the town. Click here to view photos from the 2010 Memphis Italian Festival. Thank you for your kind words about our festival. Hope to see you back next year! Thanks for your kind words bour our festival.